Hello H&M girl! ; ) I love the dress and sweater layered, and I even kind of like cold November days (it HAS to stop raining here though). Return email on the way! omg I KNOW. I looked in my closet and had a long hard talk with my wallet about easing up on the H&M for the next few months. Seriously. Its insane. Everything I own is from there I think at this point. 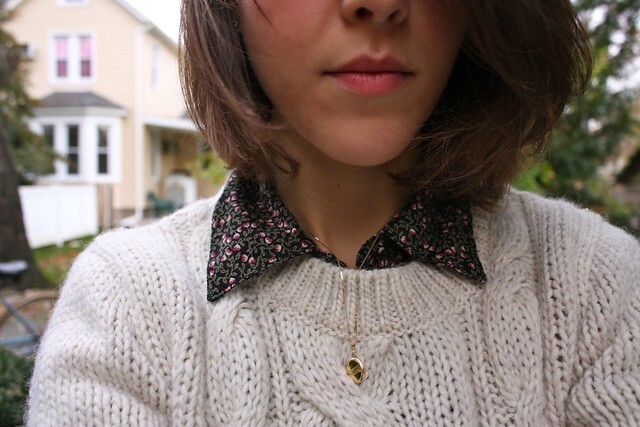 So many times your pictures remind me I should try a collared blouse with a sweater, and let the collar peek out over it... I still haven't tried. :) But I still like it! I love it. The sweater is so cute layered over your dress. Cute boots too. 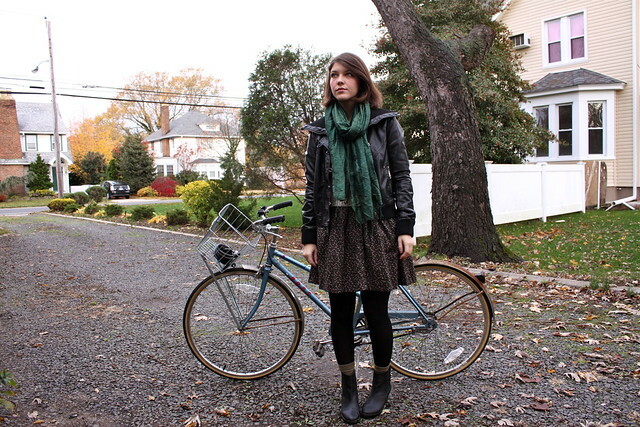 cute collar and cute bike :) take me to your november! Lovely! That's such a cosy looking sweater. I can't wait for the weather to get chilly! ahhh Kallie, you look so fab!! I love all the layers going on here. You are straight in my inspiration folder, yet again!! The dreary weather must be affecting your mood. This is the saddest I've ever seen you look. Normally you're perky and cheerful. I hope your mood lifts. The clothes are nice. Oh, and I mentioned you on my blog today! oh oh! your blog is beautiful! i'm so happy i just found it. and this sweater looks sooo comfy i love it! What a perfect autumn outfit, masterful layering skills. Very happy to have found your lovely blog! I'm sure you get this an awful lot, but I could almost mistake you for Alexa Chung in some of these photos! Your blog is extraordinary, would it be OK to add it to my blogroll? Your style, and photos, and you in general are lovely, lovely ,lovely. Wow, I love this outfit! That bike is fantastic, too, by the way. I think I tried on that sweater at H&M, too - I wish I'd bought it now that I see how cute it looks on you! this is fall perfection! Thank you so much for the thrifting recommendation, I can't wait to take a field trip to state college!